A reader challenged me to write a day in the life post. (Hi, Gabrielle!) I started thinking about Tuesdays, one of my two work-from-home days, when I do all of my laundry between working and parenting. A lot of people despise laundry but I really don’t mind it. In fact, I kind of like doing it… I thought I could share some ways I make it efficient so it doesn’t consume too much of my life. I do all of my laundry on one day for the most part. Exceptions are a load of towels or sheets thrown in at a random time during the week. Other than that, I follow my mom’s tradition of Tuesday being laundry day. I typically do 3 loads on a Tuesday: light, dark and extra-dirty OR light, bright and dark. I put the first load in around 8:00 in the morning. By mid-morning, I shift the first wet load into the dryer and the second load goes into the washer. After lunch it’s time for the first load to come out of the dryer, the second load goes into the dryer and the third load goes into the washer. Mid-afternoon the second load comes out of the dryer and the third/final load goes into the dryer. By evening the last load is dry and folded and everything is put away, typically before dinner. I fold the clothes immediately after taking them out of the dryer and sort them as much as possible right then, too. The clothes never leave the laundry room until they’re taken to be put away. Each time the clothes move it adds more time. (You will never find laundry piled up in my living room or in folded stacks on my kitchen table—it’s either in our bedrooms or it’s in the laundry room.) The first load is folded while the second load is drying and the third is being washed. It takes 10-15 minutes. Since Jason and I have two baskets that go to our room, I put all of his clothes into one and mine into the other to speed up the putting away process. Ali’s clothes are small enough that I can make three piles in her basket as I’m folding her clothes: one for pjs, one for tops and one for bottoms—these coordinate with the three drawers in her dresser, making putting away her clothes take less than 5 minutes. Ali loves to be my laundry helper. Sometimes her “help” slows me down but I realize I’m sowing seeds for the future so I never turn away her assistance . She’s good at helping me move the loads from washer to dryer. She also likes “the matching game” which is simply finding sock matches. Her folding, sorting and putting away skills are not there yet. There you have it. I do three loads of laundry in one day and it takes less than an hour. I admit, we have a few factors that make it easier on us. There are only 3 of us (for the moment). When we had two little girls it took much longer to sort through all their similar size and color little things. Also, Jason and I are not very big people so we can probably fit more of our clothes into a load than bigger people. And lastly, we re-wear a lot of clothes multiple times before washing, especially larger and heavier items like pants and sweaters. Oh, also, I very rarely iron anything. This entry was posted on Monday, April 7th, 2014 at 6:00 am and is filed under Family, Other. You can follow any responses to this entry through the RSS 2.0 feed. You can skip to the end and leave a response. Pinging is currently not allowed. Sounds like you learned a lot watching your Mama do laundry, which is where I learned- watching MY Mama. Good job, sweet girl. Your daughter is already learning lots from her Mama. 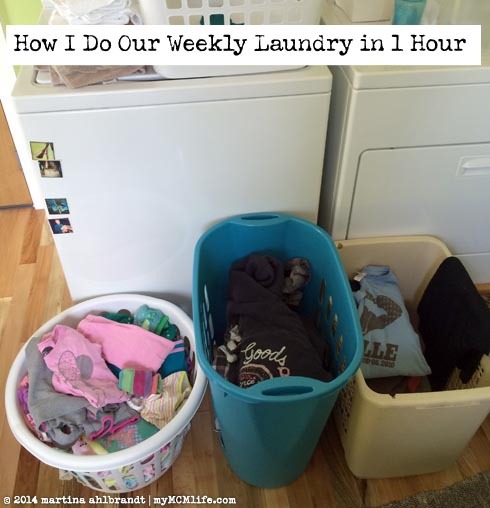 I pretty much do my laundry in the same way (although we have four kids and a slow dryer, so I have to do 3-4 loads a day on two days). If I were ever in a position to plan/remodel a laundry room, I’d definitely include a place to fold. As for now, I fold everything on our bed–lots of space for the many piles of clothes with so many little ones in the house, and I usually watch an episode or two of a favorite show while I fold. I actually don’t mind doing laundry either–I think it stems from the fact that we used community laundry rooms/a laundromat for the first 6 years of our marriage and the first 4 years of parenthood. Now that I have a washer and dryer in my garage, it seems absolutely relaxing and easy! Love this, it’s my style of doing laundry. Our differences: I do all washes in cold water so as long as the item has been washed at least once already, I don’t worry about lights and darks. (I just heard a gasp from a bunch of readers…don’t hate me, my clothes are still clean and look great!) Not sorting by colors allows me to sort instead by room. One load for the girls, one load for the boys, one load for the parents. One load for towels. And of course the random loads as needed for sheets, etc. We are currently working hard to teach our kiddos how to wear certain items more than once, and this has really helped keep us to one load per room per week. We do use the couch (nowhere in the laundry room to fold) but the second it hits the couch it is being sorted and folded by the owners of those items. Someday you won’t have to sort clothes any more either, Martina! I fold mine in my room usually and while it might sit on my bed a bit longer, it is put away almost as folded and definitely before bedtime. I really can’t understand why people are always doing laundry and have so many loads per week! I have five very active kids and I usually only do about four loads a week. And I intend to keep it that way! My soul sista! I didn’t know that washing in cold helps the colors not to bleed. I wash with cold water anyway. I’ve never been too particular about colors but I’m not sure I could put a pair of dark jeans in with one of Jason’s white shirts. Eek! I love the sorting by rooms concept. Yes, whenever there’s a white shirt (dress shirts, we do T-shirts all the time) then I’m more careful. Usually what I’ll do is sort out my clothes with the towel load (we have both light and dark towels – when everyone gets their own color that is to be expected) so I’ll make sure the white shirt is in with the white towels and the jeans in with the dark towels and everything else more or less (mostly less) by color ends up evening out the loads. There are some “color safe” products out there that have done really well too, and sometimes if I’m only a little worried I just add that to the load and wash it all together. I’ve only ended up with pink shirts a couple times, and it was almost always with a brand new item that I should have known better with.